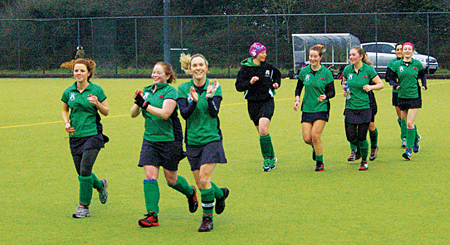 Celebrations for Greenfields Ladies Hockey. Greenfields Hockey Club celebrated winning this season’s Connacht League on Sunday, but have put the celebrations on hold until Saturday’s Irish Hockey Trophy final. The club faces Northern side Lisnagarvey in Belfield on Saturday looking to retain the trophy they won last year after a superb 3-0 win over Belfast Harlequins. This was an outstanding team performance and Greenfields can travel to Belfield on Saturday (1.15pm ) with confidence in their ability to compete at this level and hopefully lift the trophy for the second time. In what has been another super season for Greenfields, last weekend’s 4-0 win over Athlone in the Connacht League also ensured the title and their entry in the Irish Hockey League next season - the first Connacht club to ever play in the Irish Hockey League which comprises the top 12 teams in the country. The win followed the club’s victory away to Belfast Harlequins in the Irish Trophy final. Against the hot favourites, Greenfields produced a display of sharp attacking and well drilled defence to pull off this well earned victory and the opportunity to claim their second title in Belfield next Saturday when they face Lisnagarvey. All the pre-match nerves were dispelled early as a sharp intercept by Alma Whelan inside the circle led to a penalty stroke which was confidently dispatched by Sarah MacDonald after four minutes. Quins pressed hard for an equaliser but the Greenfields defence were able for every threat with MacDonald, Clodagh Grealy, Catherine Moore and Aine Collins keeping the Quins defence out. Harlequins’ only real chance after 12 minutes brought a good save from keeper Sinead Collins as the visitors continued to dominate possession with Elaine Hall, Neasa McGettigan and Trish Garrett controlling the midfield. The pressure was rewarded in the 16th minute when a cross from a free on the left from Aine Collins was cleverly flicked home by Liz Tighe. A minute later a great shot from Becky Anderson just went wide. The crucial third goal came just a minute later when McGettigan sent a great pass to Anderson who found Garrett on the left. Her clever flick found Mary Healy who calmly placed it beyond the keeper. Greenfields continued to dominate the second half, but scoring chances were at a premium. Good work from Grealy, MacDonald and Siobhan Divilly helped Greenfields see it out to the end with a controlled display.